I again make reference to the letter written by Thomas Arthur Palmer in that he stated that Edward Stacey established a small orchestra in the final years of the nineteenth century. Arthur may have been misled by whoever told him as there are no mentions to be found in the MT of either Edward Stacey being connected to the band or of any orchestra. If an orchestra did exist it certainly was never mentioned (as such) but usually there is no smoke without fire and I believe that Edward did indeed form or at least lead a group that is described as “the band” in not only the 1895 report but possibly the 1882 report as well. Let me tell you what makes me think this. It may well be that a small orchestra had been formed of brass, reed and string players, members of JB Alders band were left with no leader and may have jumped at a chance to play again. Bill Deacon said that as a young lad he would often spend evenings working alongside Albert Stacey in his bakery. Albert was Edward’s son and he often told Bill stories during the time that he spent with him. He told him once that an attempt to include string instruments had ended in failure as the climate that we enjoy here in Britain does little to enhance the stability of wood and strings when being used out of doors. This meant that the strings had to be replaced by reed and brass. This demise of strings may also be the reason that Albert took up playing the euphonium (we know he played the violin) and this removal of string instruments was probably known personally to him, Bill Deacon agreed with me on all of this anyhow. Albert never actually told Bill that his father had led the band but this 1895 “the band” may not have been exactly the same type of group that Albert himself had led from 1898. (yes it’s to him we turn to next) and therefore he might not have thought it necessary to elaborate further. This is not my own personal conjecture but is is the best I have been able to put together so far, Someone was the leader of that 1895 band and both Bill Deacon and myself believed Edward was it. We know Edward was the leader of the Wesleyan choir in 1897 and I cannot see any reasons that he was not leading a musical group subsequent to that. Odd village events mention Edward accompanying various people on the piano so he was definitely a pianist but could he play a stringed instrument as well? Any proof of this is impossible for me to show but as many people appeared to have been able to play a violin or whatever, I see no reason to think that Edward couldn’t, Albert his son could and Edward did too I’m sure. In his later years Edward was most certainly a keen band follower being a recognised village and consequently a collector for the band as well. He can be seen on the 1922 picture and like Albert was well involved with village life in general and so this family are of great interest to us here. Edward Stacey was born in 1856 and on leaving school found employment as an agricultural labourer (who didn’t). In 1891 Edward and Ann his wife, Albert and Emily their two children, lived in Pond Place, what is now known as Pond House and if you take a peak at the two photos dated c1900 you can see that they were taken in the back yard of that property. In 1891 Edward’s occupation was that of a general dealer and toy shop owner. Edward was conducting the Wesleyan church choir from 1897 through to at least 1905. In 1902 he took over as secretary of the “Pig Club”, it being formed in 1895 this being an office previously held since 1899 by Henry Brind Sheppard yet another of our active bandsmen. Edward was also a member of the Temperence movement being described in 1923 as a “veteran to the cause”. He was obviously a good Christian man but he thought nothing of “sticking a pig” for Thomas Orchard in 1894, any Christian thoughts didn’t stop him, it’s funny how life’s values have changed isn’t it? Although it is probably the Edward Stacey ensemble that turned up briefly in 1895, a band is not mentioned again for sure until 1897 when it reappeared playing once more for the “Aldbourne Benefit Club”. The writer said “this band is of recent origin, but it gives a great promise of success and excellence”. Evidently it was not yet quite up to scratch or full strength and it was not until the following year that it really made any impact on village events. The two photo’s of c1900 show Albert and his band wearing their brand new uniforms, Albert, then 20 years old, is not only the the band’s euphonium player but as we can see by the much more ornate uniform he is wearing the leader as well. Albert continued this manner of dressing slightly differently to the other bandsmen not only when they purchased their next uniform prior to the first war in c1912 but throughout his time as bandmaster. Please note that in 1911 the band again purchased new instruments at a cost of £130 so it must be c1912 that the next photo was taken. The position of being a leader and not just a conductor can be likened to a player/manager of a football team and most would actually conduct and play at the same time, instrumentalists were always at a premium. With most performances consisting of parading around streets and therefore the playing of numerous marches, most of the stick waggling would have taken place in the rehearsal room and not in public. Albert had an unusual little feature he would often employ for he would not only conduct the band and play the euphonium but when coming to what is known as a “bass solo” spot he would pick up his piccolo and join in on this instrument. Molly Lunn (Albert’s daughter) recalled as a little girl watching her father’s band parade out along South Street and that the last thing she heard as they marched into the distance had been the faint sound of her father’s piccolo. Albert continued to be both a player and conductor for the most part until at least 1905. When Molly saw the photos of her father with his band she sat there for several moments in silence eventually telling me that this was the first time she had ever seen her father without a moustache. I can only guess that Bert’s father taught him to play the violin and or the piccolo and his ability to accompany singing on the piano (chords only) and his brass playing would have made him a most knowledgeable musician and therefore a much respected man with his colleagues. For he was still a very young man of eighteen when he became the leader in 1898 and as you didn’t achieve recognisable manhood till the age of 21 one so young must have been unusual. This 1898 date is confirmed in the inscription on a tea set that was presented on April 30th 1913 on the occasion of his marriage to Mable Fanny Penny. It tells us that by 1913 he had already given the band fifteen years service as its conductor. 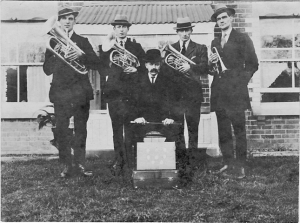 In 1911 Albert had been presented with a silver and ebony baton for “services rendered”, it was probably just a thank you for all his hard work, it was given on behalf of the band by the Reverend William Butler and Albert can be seen holding with it in the “prize winning quartet” photo. The first event that recorded Albert’s name as leader appears to be at a children’s service for “the Missionary society” in 1899. 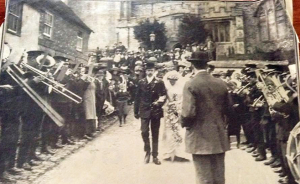 This was the first of several engagements that year that included the usual flower show, hospital parade, Chilton Foliat’s flower show and finally Ramsbury’s F S parade. “it is rumoured that after many years of zealous care and tact, and much public appreciation, bandmaster Stacey has signified his intention to resign his post. Mr Stacey has discharged the duties with ability and energy, and it is feared the band (having recently lost several members) is in a critical position. Hopes are entertained that Mr Stacey will reconsider his decision. Under any circumstances it is hoped a little less of open air trumpeting by unattached soloists on single instruments, especially on Sundays, will be heard in future. The services of the band have always been appreciated, and it is hoped that it will survive the present difficulty”. A reply signed by “Narcissus” was printed the following week but its unnecessary to record it here in its entirety. The writer, (Tommy Liddiard himself perhaps?) stated that things were now ok and that the unaccompanied playing was merely bandsmen practising at home, a necessary function of all bandsmen to improve their playing standards. Albert once told Bill Deacon that at contests he would meet a Stacey who was a relation and who was also the conductor of the Inkpen band. Two have been found holding this position, Andrew as early as 1906 and then Henry to as late as 1932. 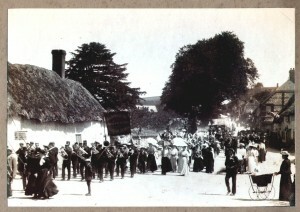 The Inkpen band had various names such as Imperial, Silver Prize and but the night their Temperence band provided the music for a village dance must have been a sobering experience. According to Albert they were as good as us in those days, and so they would have been with all of the bands in this area being of a fairly low standard. In 1908 Walter “Tapey” Lawrence jnr organised a church choir outing to London where they heard the performance of four brass bands. The report remarked that “a doubt” had been raised by the choristers “if the Aldbourne brass band was fully up to the mark”, they most absolutely would not have been! Although they had started winning contests under Albert well before the twenties and indeed had started to worry other bands well before the first world war, the band were not really any better than others until the coming of a professional conductor named Dimmock in 1922. Albert was a baker by trade having done his apprenticeship under Alfred Williams whose bakery stood at the side and to the rear of the Masons Arms. Albert’s bakery was to be found next to next to “Mr Well’s bell shop”, where the petrol pumps once stood in Bell Square. Albert also kept pigs somewhere near the present site of the tennis courts in Castle street and was a member of the 1914 formed Aldbourne Agricultural Co-op society. During his years as conductor, many contest trophies and medals were to be seen displayed in the little window of his bakery shop. In the thirties our winnings were displayed in the window of the Wessex Electricity Co that occupied buildings opposite the library and that were once part of the bakery complex of Alfred Palmer. During Albert’s leadership the band enjoyed relative stability, by 1905 it was at least 20 strong and this strength must have helped in the permanence of our band throughout some extremely difficult times yet to come. The popularity they enjoyed in this area brought them financial gains but Albert’s permanent retirement in 1922 was sadly not a happy occasion. 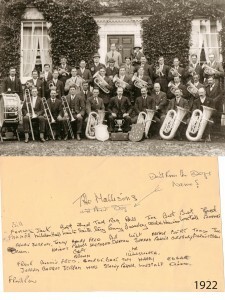 The band had been of late successful in winning prizes at contests and many offers of work had come in due to this success. The committee at that time decided it might be a good thing if a professional conductor was used for future contests, the band could afford it and it should improve their bands standard further. This first professional conductor may have been a Mr Brooks or a Mr George Cave but how the fog rolled in thick on this one. Cave certainly existed as a farm manager at Baydon and he was a musician but as to who Brooks was will have to remain a mystery. According to Molly Lunn, her father heartily approved of all this and he thought that to have a more professional man in for contests a good idea but sadly his wife did not agree. She thought it was insulting and not only did she demand that Albert sent his resignation to the band, she actually wrote it out for him! It would appear that she believed the band would back down on receiving a letter of resignation, but tragically for Albert she thought wrong. Albert’s resignation was taken very badly by his fellow bandsmen some of who went as far as booing him as he left the band room. Albert wouldn’t admit to them that it was his wife’s doing and not his as Mable was a of a very strong character and so poor Albert had to suffer the consequences of her actions, never again playing his piccolo, or piano. Some village folk even went as far in their snubbing of him by buying their bread from another bakery. Molly Lunn said in her mother’s defence that with Albert being a baker he generally worked late into the evening and started early in the morning. He was also a bell ringer, bandsman, member of many committees, church chorister and was often out of an evening appearing in village entertainments either playing his violin or singing. Molly thought that the pressures on her mothers’ shoulders of the cash collecting on Saturday mornings when folks came in to pay their bills, bringing up a family etc. simply became too great for her to bear. She just got fed up with him being out all the time and that this suggestion was the last straw. She probably felt, and I think justifiably, that all the efforts she had put into backing her husband as a supportive wife were not being appreciated either. Albert’s last known time as a conductor occurred after his departure in 1922 when he was asked to conduct the Lockeridge band at a contest at Longford Castle near Salisbury. Aldbourne won their section but Lockeridge band came nowhere. The year following Albert’s departure his old band showed little compassion for they included in a concert program a descriptive piece called “the deaf bandmaster”, somewhat heartless you must agree. This was then a sad end not only to the one who incited our band’s development but to a man who only ever gave of his best. Albert retired from baking in 1953 and died in 1962.